Also perturbing Damon is Stefan’s feeding on human blood from the vein. Stefan has a terrible history of ripper-ness where he just goes completely off the rails and massacres people over and over. Stefan’s confident he can test his self control, Damon not so much. Stefan is definitely having fun and he decides to focus on a doctor. A wonderful kind woman, who is definitely not evil – and he promptly arranges an incredibly elaborate scheme to tempt her to evil: basically to convince her that Damon is the man who killed her parents, put him in her care and then continually prod and poke her to kill him. Not good? Certainly. Worst of the worst? Maybe I just have a low opinion of humanity but I think Stefan’s pushing people into murder this strongly isn’t quite killing the worst of the worst: Damon’s certainly uncomfortable with it. Looks like Cade was right about how much fun Stefan would have as his Ripper. But afterwards goes looking for the necklace still. 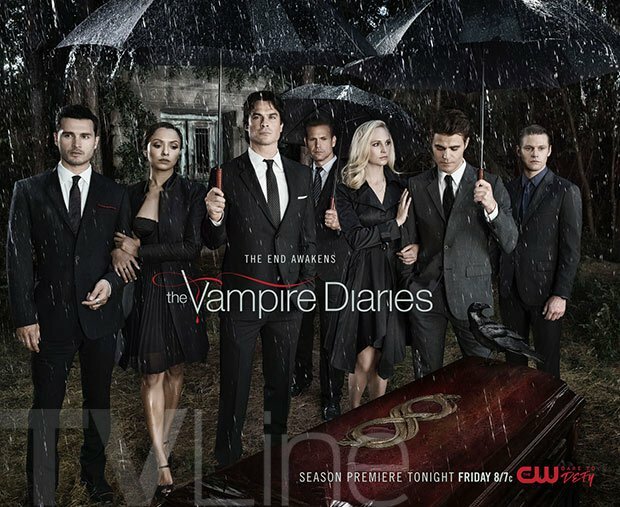 Oh, and Stefan succumbs to ripperdom and slaughters a hospital: this is like his 9th massacre and I’m sure we’ll forgive him this one as well. AAAAAARGH, the horrible flashbacks to early seasons where all these characters ever did was prepare for one founders’ celebration or another?! And my gods how little news can a town have where a story about a high school preparing for a parade makes the paper? C’mon this is a town where every supernatural thing in the world regularly massacres people and this is the news they have? I wish I could say this is just a lie on her part – but, really, with this show’s morality who knows? Yes he’s still around. How a show with this many casualties and this many actors leaving it has managed to cling onto someone so pointless for so long amazes me. Matt is, yes, still around and drops in to see Dorian (Alaric’s new student who is now looking after the Armoury and putting his life at risk for reasons we’re told rather than shown. We could spend time developing this-soon-to-be-snack-food but instead we have Matt. And his dad). While there he meets, yes, his dad and all the daddy issues come out to play. And most of it feels like some kind of weird justification for Daddy Matt for why he hasn’t been around – which makes it all feel less like an exploration and more like a really dubious excuse. They do do some research about the bell of anti-sirenness and they know where it now is – which they tell Caroline so she and Sybil can go bell hunting while Matt and Daddy Matt can untie all the kids from the stakes before they’re burned by another mind controlled kid with a torch. Personally I’d have taken away the torch first, but then you wouldn’t have the tense ending. She also pokes Caroline’s love of Stefan – because Caroline is so sure Stefan will come back from whatever ripper rampage he’s on (again) and she will forgive him for all the deaths (again). But Sybil (speaking my mind) asks what will happen the next time Stefan falls off the wagon… especially if Caroline wants a life with him and her little kids?